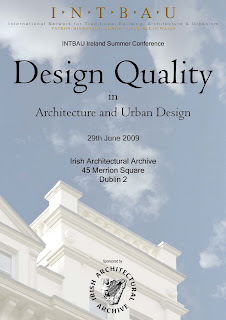 INTBAU Ireland is pleased to announce its inaugural Summer Conference, "Design Quality in Architecture and Urban Design", to be held at the Irish Architectural Archive, 45 Merrion Square, Dublin 2, Rebublic of Ireland, on 29 June 2009. The event is sponsored by the Irish Architectural Archive to whom we are very grateful. Conference Fee €80 (£75) per person, including lunch and refreshments. More info on the INTBAU website.